Headlining Sponsor: Outdoor Research! Welcome Back! Howdy folks! The psyche is high here in the Mount Washington Valley as the temps drop and the ice starts to form. We have a lot to celebrate this year with the 20th anniversary of Ice Fest. First and foremost we’d like to bring your attention to our returning Headlining Sponsor, OUTDOOR RESEARCH!! This company has been one of our best supporters, bringing you bigger and better Ice Fests every year. They started back in 1981 with one product, gaiters. Since then their growth has been exponential from gaiters, to stuff sacks, to gloves, apparel and casual clothing. The people who use the product design the gear. They listen to what their customers have to say, and bring those ideas into the products you use. They’re run on human powered adventure, and so are we! Click here to see an awesome video about the Outdoor Research brand. 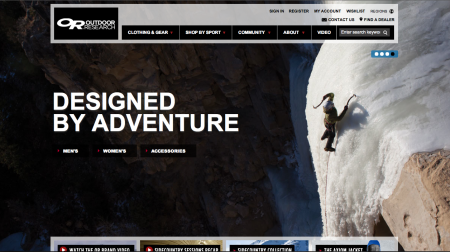 Click here to be taken to year round adventure and entertainment from Outdoor Research Athletes. We’re psyched to have them back on board again this year!